It’s January—the time of year when contemporary art periodicals publish their “Best of the Year” selections, summarizing what has happened or what is to come. These annual reflections often present an array of projects (in some cases organized geographically) but rarely develop an idea or concept. 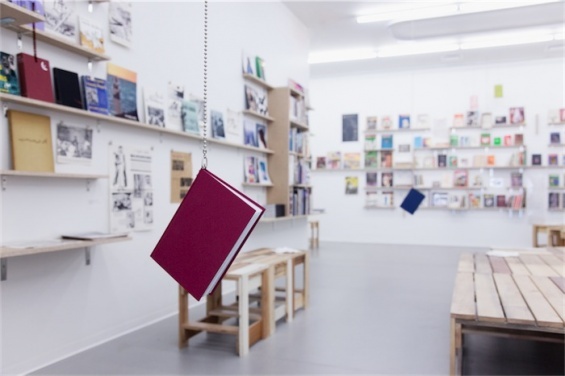 To start 2013, this posting plays off this impulse to collectively reflect with a roundup of international contemporary art initiatives that rethink the endeavor of archiving—perhaps the ultimate attempt to summarize, recapitulate, or preserve the past. Instead of recounting a stable narrative of what has happened, these six endeavors represent various efforts to expand the potential for research, exchange, and collaborative ways of working. Moreover, each initiative, in its own way, melds the information sharing possibilities of a digital platform with substantive content. This roundup seeks to draw attention to shared affinities that arise among six initiatives that are responding to the social, cultural, and geographic terrain in which each exists. We tend to think of archiving as the inward movement of collecting things: finding bits and pieces, bringing them together, guarding them in a safe and stable place. The model of this type of archiving is the fortress, or the burning library. This model already provides a clear sense of the limits, or ends, of the archive: fire, flooding, data loss. Can we think of the archive differently? When Henri Langlois, founder of the Cinémathèque Française, stated that “the best way to preserve film is to project it”, he hinted at the very opposite philosophy of archiving: to actually use and consume things, to keep them in, or bring them into, circulation, and to literally throw them forth (Latin: proicere), into a shared and distributed process that operates based on diffusion, not consolidation, through imagination, not memory, and towards creation, not conservation…. In October 2010, Museum as Hub partner Townhouse in Cairo organized the three-day symposium, Speak, Memory: On archives and other strategies of (re)activation of cultural memory, which included pad.ma’s presentation on its “10 Theses.” The symposium was notable for its program that not only focused on archive practices of the Middle East, Asia, and Latin America but also had the foresight to create an archive of speakers’ papers and panel discussion transcripts available for download. In addition, they collaborated with pad.ma to make symposium video documentation viewable online and free for download for noncommercial use. Access commentary on the symposium via Arts Collaboratory, artforum.com, or Townhouse. From Cairo, I look south to the Cape Town–based Chimurenga, a Pan-African platform for writing, culture, and politics. Although not quite an archive in the conventional sense, Chimurenga’s various activities seek to gather and give shape to varied perspectives and experiences from the African continent and diaspora. Their projects include the indispensible Chimurenga Journal, thematic explorations of Pan-African art, culture, and politics published three times yearly; the “African Cities Reader” series, which explores cosmopolitan typography of urban Africa; the Chimurenga Library, a collection of Pan-African publications that inform the project; and the Pan African Space Station (PASS), Chimurenga’s cyberspatial platform for music and events on the internet and in venues across the African world. From your computer, tune into PASS radio’s 24/7 stream of “themed shows, live performance, readings, sound art, and interviews” that cybercasts from Cape Town and satellite studios in Limbe, Cameroon, and Kisangani in the Democratic Republic of Congo. This roundup would be remiss to exclude the ambitious work of Asia Art Archive in Hong Kong, founded in 2000 to develop an archive of primary and secondary material on contemporary art in Asia. Search the collection’s catalog or browse digitized materials in the Collection Online. For a more in-depth look at various archiving practices and a mapping of the greater field at large, consult issue two of AAA’s Field Notes. Unlike Asia Art Archive, Red Conceptualismos del Sur (or Southern Conceptualisms) is an autonomous platform for thought, research, and collective positioning without a building for its research and materials. The platform consists of an autonomous network of about fifty-five researchers from Mexico, Peru, Ecuador, Chile, Argentina, Uruguay, Brazil, Paraguay, Colombia, the United Kingdom, and Spain, who study the politicized conceptual practices in Latin America since the 1960s. Instead of building physical infrastructure, Southern Conceptualisms has strategically collaborated with institutions such as MACBA in Barcelona and the Reina Sofía in Madrid to establish a symbiotic relationship in which Southern Conceptualisms shares their research and materials, and the institutions provide the capacity for their conservation and potentially their presentation in a gallery. Check their blog to learn more about their recent activities (in Spanish), get a hold of their recent contribution in Third Text, and (returning to the work of Asia Art Archive) read texts by various members and view a brief chronology of the network. The roundup concludes with the New Museum Digital Archive, which contains documentation of the New Museum’s program and institutional history through images, video, audio, publications, and printed matter. In the Digital Archive, you can browse projects developed by the New Museum’s international initiative, the Museum as Hub, including two projects that contribute to this dialogue on archiving: “Bidoun Library Project” and “Steffani Jemison and Jamal Cyrus: Alpha’s Bet Is Not Over Yet”, bringing this dialogue back home.